Published February 10, 2019 By Leisa Good This post may contain affiliate links. Regardless, I only recommend sites I've researched and/or used and trust. Would you like to learn medical transcription? Are you looking for an online school which may offer that option? 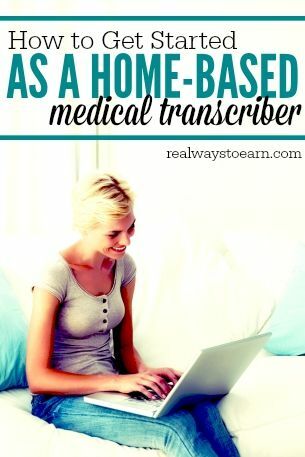 Do you still want to work at home once you become a medical transcriptionist? Then CareerStep might be the school for you! What is Exactly is Career Step? CareerStep is an online school which offers a variety of programs, one of them being the medical transcription program. Career Step has been in business for over 20 years as a vocational school. The medical transcription program takes between 3 to 12 months, and you can go at your own pace and have access to the materials 24/7 online. As many of you work-at-homers (WAHers) know, medical transcription or any type of transcription can be a great work-at-home career. Local doctors in your area as well as online companies and even bidding sites such as Elance look for medical transcriptionists. While the medical transcription training course will not allow you to become certified upon completion of the course, you can take the exam for either the Association for Healthcare Documentation Integrity certification (AHDI) or the Certified Healthcare Document Specialist certification (CHDS). Career Step will even give you a $250 voucher to take the AHDI exam upon completion of the course. It appears that they only accept US and Canadian students for the medical transcription program. What other programs are available at Career Step? What Does It Cost to Attend Career Step? If you are a military spouse, you may receive up to $4,000 from MyCAA (Military Spouse Career Advancement Accounts), which could go towards a vocational career including medical transcription. The cost of the medical transcription program is $2,999. And yes, there is a payment plan available. You can pay for this in 3-monthly installments or 12-monthly installments. You can also ask about the scholarship programs. Does Career Step Guarantee Clients/Jobs After Graduation? Are There Any Alumni Success Stories? This one military wife was on a YouTube video speaking about how the program worked for her. Here are some of the other alumni success stories. Then there are a few mixed reviews on another forum. As always, it is a good idea to do your homework and decide for yourself if this is the right opportunity for you. Overall, it looks like they have a great reputation. There were also online reviews at Indeed, where students spoke very highly of the program and how it was well worth their time and money. Are There Any Other Reviews? In an older post on this blog, a guest writer stated that Career Step is a faster and less expensive option than Andrews and M-TEC — two other well-known schools for medical transcription training. However, the writer went on to say that no personal feedback is given on your work, and you would also need to be highly motivated to attend class there for a few mentioned reasons. It's definitely worth noting that Dave Ramsey, well-known financial advisor, fully endorses Career Step. Does Career Step Have a Better Business Bureau (BBB) rating? Career Step has an A+ rating with the BBB and has been a member since 2001. The headquarters is in Provo, Utah and the business itself has been around since 1992. How Would An Interested Individual Get Started with Career Step? You can go here to read more about the training and get started. Remember, payment plan information is here. If medical transcription isn't for you, they do have several other programs including medical billing & coding, which can also be done from home. If you're still on the fence and feel like you need more information, Career Step does provide a way to request it via their website. Post originally published July 17, 2015. Updated and republished on February 10, 2019. Career Step is a great place to learn and prepare for a job in medical transcription! I am a graduate of this online school in 2007. I’ve had an at-home job of medical transcription for over 8 years now. Doesn’t seem to be a good paying job unless you sign in as an employee and have fixed hours with set line counts. I’ve done only independent contractor and make 3 cents per line for VR and .065 cents for straight typing. A friend of mine did well, though, as she got hired under employee status with insurance, 401K, paid vacation and was making about $2000 per month. Just have to find the right company and decide if you want employee versus independent contractor status. I can’t say enough good things about CareerStep. I’m a current student in their medical transcription program and not only is the support awesome, it’s the only program I’ve been through that gives students real world experience. I’d definitely recommend it for those who have decided that they are interested in being a medical transcriptionist. @Nicole – That is absolutely wonderful. So glad to hear that.